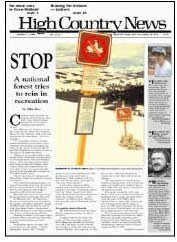 Recreationists of every kind have long used Colorado's White River National Forest as a playground, and the Forest Service's proposed new plan, which would limit some activities in an attempt to help the forest, is being met with a lot of anger. Recreationists, environmentalists, politicians and agency employees are among those offering comments on the White River National Forest's proposed new plan. Jim Gonzalez, a hunter who loves roadless areas, says that the White River National Forest caves into ski areas and other special interests. Guidebook writer Lou Dawson says that the White River Forest should be managed for people and their use. The White River National Forest stretches most of the way across Colorado from the Continental Divide to the Western Slope. The six remaining White River forest plan alternatives are briefly described. On Colorado's White River National Forest, Assistant District Ranger Bill Johnson, a former sawmill worker, is responsible for roads and road removal, a subject at the heart of disputes on the forest. Also, Tony Vangalis, in his own words. The Matt Clow Endowment, created by Clow's parents in memory of their son, will support the fisheries research of a Montana State University graduate student. Headwaters' ninth annual conference will be held in Ashland, Ore., Feb. 3-6. The Forest Service hosts this workshop at Fresno State University, Feb. 11-12. A weekend of discussion, readings and recreation takes place in Wallowa Lake, Ore., Feb. 25-27. Two levels of training are available at the Silverton Avalanche School. Rep. George Miller, D-Calif., is featured speaker on agriculture at the annual conference of the Family Farm Alliance, Feb. 28-29. Vandals cut down lone tree near Connell, WA; Tom Rodal advertises for wife; wolves eat dogs in Fairbanks, AK; SLC second place in eating Jello; hippies vs. ew bikers in Jerome, AZ; Westword's weird events; Kootenai Co., ID approves nudist resort. Y2K, why bother? HCN board meeting and potluck in Las Vegas; new interns Catherine Lutz and Robyn Morrison. Earth Liberation Front fire destroys Boise Cascade headquarters in Oregon; Great Basin Nat'l Park now cattle-free; treesitter Julia "Butterfly" Hill comes down; BP Amoco plans coal-bed gas wells in La Plata County, CO; mining in Siskiyou Nat'l Forest. As traditional logging declines on Montana's Flathead National Forest, the Flathead forestry project experiments with a new form of logging that rewards the loggers for restoring sick forests through environmentally conscious work. Environmentalists, scientists, Indian tribes and other locals are appalled by the Army Corps of Engineers' plan to dredge the Columbia River so bigger strips can move between the Columbia River Estuary and Portland. The state of Oregon has ordered Portland to reduce sewage overflow into the Willamette River by 94 percent by 2011, but City Commissioner Dan Saltzman says the pollution problem is more complex than that. The Blackfeet Indian Tribe has released 30 captive bred swift foxes onto the reservation in Montana. Why not brake for kittens?